20 February is recognised as the day of the prophecy of Musleh Maud in the Ahmadiyya Community. In this prophecy God informed the Promised Messiah (on whom be peace) that he will have a son who will serve faith and will have numerous qualities. The Promised Messiah (on whom be peace) said that this was not just a prophecy but was also a magnificent heavenly sign which God manifested for the truthfulness and greatness of the Holy Prophet (pace and blessings of Allah be on him). And this sign was far superior, grander and loftier than a sign which would bring a dead person back to life. Fact is that the soul of dead person can be only brought back to life through prayer and this matter is copiously contested. However, in this instance through the grace of God and blessings of the Holy Prophet (peace and blessings of Allah be on him) the Promised Messiah says his prayers were accepted and a promise was made to send a blessed soul whose evident and latent qualities would spread all over the world. Even if this sign seemed or appeared to be on par with a sign of bringing the dead back to life but it is realised upon thinking that it is indeed hundreds of times a better sign. Dead souls are brought back through prayer and here a soul was sent for through prayer but those souls and this soul were poles apart. Indeed, the world witnessed that this prophecy of the Promised Messiah (on whom be peace) was fulfilled most gloriously. And time proved that the manifestation of the prophecy was none other than Hazrat Mirza Bashir ud Din Mahmood Ahmad. People of the Jama’at felt at the time that the prophecy was about him but he himself did not say it or announced it. So much so that thirty years of his Khilafat passed. Eventually, he announced in 1944 that he indeed was Musleh Maud. On 28 January 1944 Hazrat Musleh Maud (may Allah be pleased with him) said that he wanted to say something which did not come naturally to him and about which he was innately uncomfortable but since the matter was connected to Divine will as well as Prophethood, he had no choice but to speak about it. He related a long dream of his and said that God had destined his person to be the fulfilment of the prophecy of Musleh Maud. He said people had repeatedly asked his view on the prophecy but he had never even tried to read the prophecy in earnestness lest he experienced self-deception. Hazart Musleh Maud (may Allah be pleased with him) said that once Hazrat Khalifatul Masih I (may Allah be pleased with him) gave him a letter that the Promised Messiah (on whom be peace) had written about the birth of Hazrat Musleh Maud and Hazrat Khalifatul Masih I asked Hazrat Musleh Maud to publish it in Tasheezul Azhan (a magazine). Out of deference of Hazrat Khalifatul Masih I, he had it published but did not even read the subject-matter attentively at the time. When people expressed their views on the fulfilment of the prophecy in his person he used to stay quiet in response. He felt it was not essential for the person about whom the promises were made to announce that he was their manifestation. Just as the Holy Prophet (peace and blessings of Allah be on him) had prophesised about the railway train and after the fulfilment of the prophecy it was not necessary that the railway should have it announced. When people insisted that he should announce he was the manifestation of the prophecy he said the prophecy itself makes the manifestation clear for people to see and if this prophecy was to be fulfilled in his person the world would see for itself and if it was not to be fulfilled in his person, again the world would see. He said he did not have to say anything one way or the other. Some words of the revelation were: ‘they said that the one awaited is this one indeed or should we look for another.’ People repeatedly asked Hazrat Musleh Maud about this prophecy over a long period of time. This long period of time is also alluded to in revelations of the Promised Messiah (on whom be peace). Like it is mentioned regarding Hazrat Yaqub (on whom be peace) that [his sons] brothers of Hazrat Yusuf (on whom be peace) would say to him how long would he talk about Yusuf. This revelation was also given to the Promised Messiah (on whom be peace) as well as the revelation: ‘I smell the fragrance of Yusuf’. This was to inform him that the fulfilment of the prophecy of Musleh Maud will manifest after a long period of time. Hazrat Musleh Maud was convinced that even if the prophecies had not been manifested till the time of his death, even then the situation and accounts would have revealed that they were fulfilled in his person. However, he said, God did inform him that he indeed was the manifestation of the prophecies of Musleh Maud. Hazrat Musleh Maud (may Allah be pleased with him) mentioned some aspects of the prophecy of Musleh Maud, for example, ‘he will convert three into four’ and ‘It is Monday, a blessed Monday’. It is asked what do these two mean. As regards ‘he will convert three into four’ Hazrat Musleh Maud explained that he was the fourth son to be born to the Promised Messiah (on whom be peace). Prior to him, Mirza Sultan Ahmad, Mirza Fazl Ahmad and Bashir the first were born and he was the fourth. Hazrat Musleh Maud was inclined by God to consider that the revelation did not specify sons. He said he felt ‘convert three into four’ was a reference to the time of his birth. He was born in the fourth year of the prophecy. The prophecy was made in 1886 and Hazrat Musleh Maud was born in 1889. Four years after the prophecy and with three intervening years. Thus converting three into four. ‘It is Monday, a blessed Monday’ may have other meanings and significance but Hazrat Musleh Maud (may Allah be pleased with him) felt that Monday is the third day of the week and in spiritual movements Prophets of God and their Successors (Khulafa) have their own eras. A Prophet’s time is an era in its own right just as a Khalifa’s time is an era in its own right. In the current age the first era was of the Promised Messiah’s (on whom be peace), the second era was of Hazrat Khalifatul Masih I (may Allah be pleased with him) while the third era was that of Hazrat Musleh Maud. Another revelation of the Promised Messiah (on whom be peace) ‘Fazl e Umer’ [a name given to his yet to be born son] corroborated this. Hazrat Umer (may Allah be pleased with him) was the third Khalifa after the Holy Prophet (peace and blessings of Allah be on him). ‘It is Monday, a blessed Monday’ does not signify any special or blessed day, rather, it means that he will be third among people who will be raised to serve faith in this mission. Hazrat Musleh Maud said that this revelation also fulfils in his person in a way which was out of his hands. He started the scheme of Tehrik e Jadid in 1934 in response to situation that was not at all in his control. Due to the Government of the day planning to take harsh steps towards the Jama’at and the wicked plotting of the Ahrar Movement God inclined his heart to initiate the scheme of Tehrik e Jadid in 1934 and he planned its first phase to last ten years. He said after every sacrifice there is time for Eid (felicitation) Thus at the end of the ten year phase of Tehrik e Jadid would be year of felicitation and that year was to begin on a Monday. Thus, he explained that God informed through these words that at a time when Islam will be in a weak state, an organisation for its propagation will be established. And the successful conclusion of its first phase will be a blessed time for the Jama’at. Among the words of the revelation of Musleh Maud were these words: ‘He will come into the world and will heal many of their ills through his Messianic qualities and through the blessings of the Holy Spirit’. Hazrat Musleh Maud (may Allah be pleased with him) said he saw in a dream that he is having many idols broken down. He said this indicates healing ills through the blessings of the Holy Spirit. Holy Spirit signifies the spirit of Unity of God. He also said that he saw in a dream that he is running and the ground is shrinking under his feet. Indeed, the words of the prophecy also include: ‘He will grow rapidly in stature’ and Hazrat Musleh Maud saw in a dream that he is touring a great number of countries and these tours do not quite complete his task and he plans to go further afield. He said he saw in a dream that he says O grateful servant of God, I will go onwards and will review after the travels if Oneness of God is establish and practice of associating partners with Him is erased and if the teaching of Islam and the Promised Messiah (on whom be peace) is instilled in hearts! The prophecy also said: ‘His fame will spread to the ends of the earth’, Indeed, these words have been fulfilled magnificently. Hazrat Musleh Maud (may Allah be pleased with him) also explained aspects of the prophecy through accounts in addition to dreams. When he assumed the office of Khilafat people used to say he is only a child. He explains that one day he overheard someone saying in the adjacent mosque that the Jama’at was being ruined by placing a child in prominence. He was astonished as to which child they meant. He later asked someone in the mosque as to which child was being referred to. The person laughed and said that child is you. These words of the detractor were corroborating the words of the prophecy, ‘He will rapidly grow in stature’ because a few months later the very same people criticised Hazrat Musleh Maud referring to him as cunning. Although people considered him a child, God conferred spiritual office to him. In worldly office, one can utilise force, power, wealth and much more but he was given a spiritual office at a time when a few pennies were left in the coffers and a huge debt had accumulated. Those responsible for this situation were all his distractors some of whom had remarked as they left that very soon Christians would take possession of the Madrassa building in Qadian. In material terms nothing was left and the detractors were joyous and said that times of one who has been given office were in decline. It can be imagined what the Community felt in such a situation. However, that was in the past and at the time Hazrat Musleh Maud (may Allah be pleased with him) spoke there was a world of difference and the Jama’at had grown many hundred-fold and the message of the Promised Messiah (on whom be peace) had reached scores of countries and the coffers which contained a few pennies were then filled with hundreds of thousands! Hazrat Musleh Maud (may Allah be pleased with him) said even if I die now I will leave behind hundreds of thousands and I will also leave behind a lot of knowledge. Thus the Divine prophecy of ‘He will rapidly grow in stature’ was fulfilled most splendidly. At the time the Promised Messiah (on whom be peace) announced the prophecy his enemies were attacking him from all sides. This was owing to the fact that he had claimed to be a recipient of Divine revelation. He had not yet made the claim to be a Mujjadid (Reformer) or indeed the Messiah. It is at that time he made a prophecy about having a son who would have very high qualities. When the renown of someone’s deputy is mentioned, it signifies the renown of the master. The ‘fame’ referred to in the prophecy signified that through Musleh Maud the name of Holy Prophet (peace and blessings of Allah be on him) and the Promised Messiah (on whom be peace) will reach all over the world. Hazrat Musleh Maud said this was fulfilled gloriously. During the lifetime of the Promised Messiah (on whom be peace) his message had only been taken to Afghanistan in a significant manner. In other places only the news of his message had reached. Khawaja Kamal ud Din had gone to London but he was of the opinion that neither the Promised Messiah (on whom be peace) nor the Jama’at should be mentioned by name, therefore only his name was known in London. 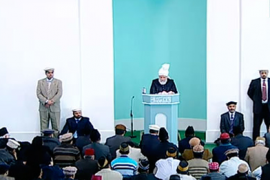 However, when Hazrat Musleh Maud (may Allah be pleased with him) became Khalifatul Masih the message was taken to Java, Sumatara, China, Mauritius, African countries, Egypt, Palestine, Iran, other Arab countries and European countries. In many place the Jama’at numbered in thousands and in Africa it numbered in hundreds of thousands. The prophecy also said: [he] will be filled with secular and spiritual knowledge’. Hazrat Musleh Maud (may Allah be pleased with him) said he was not given to making claims but he could not conceal the fact that God helped him write and speak on matters relating to Islam which needed elucidation at the time and he could assert that if those writings were put to one side, propagation of Islam around the world could not be done. He said there were many aspects in the Holy Qur’an which people would not have understood with reference to the times they lived in unless they were explained in context of other verses. He said it was a grace of God that this was resolved through him. He said Islam was going through a weak and fragile phase and through the Promised Messiah (on whom be peace) the safeguard of Islam had been re-established. However, in the lifetime of the Promised Messiah no cultural attacks were made on Islam as they were in his time. Thus God willed, in accordance with the prophecy of the Promised Messiah (on whom be peace), to exalt an individual by virtue of His Word, an individual who had the blessing of the Holy Spirit with him. Who was filled with spiritual and secular knowledge and who refuted the opponents’ cultural attacks in light of the commentaries of the Holy Prophet (peace and blessings of Allah be on him) and the Promised Messiah (on whom be peace) and the purport of the Holy Qur’an and thus protected Islam! Thus God accredited writings of Hazrat Musleh Maud (may Allah be pleased with him). Hazrat Musleh Maud said until God informed him that he indeed was the manifestation of the prophecy of Musleh Maud, he stayed silent and only spoke when God told him to tell others. He said with His grace God created situations which corroborated the prophecy. Many people had dreams in which the subject of the dream of Musleh Maud was repeated. Someone saw that an angel is calling out the name of Hazrat Musleh Maud and announcing that his name will be taken with the names of Prophets of God. Someone else’s dream had Hazrat Musleh Maud stand on a minaret and declare ‘Is Allah not sufficient for His servant?…’ (39:37) This was of course one of the early revelations of the Promised Messiah (on whom be peace) and declaring it from a minaret signified that God would further strengthen the propagation of Ahmadiyyat through Hazrat Musleh Maud. Explaining one of his own dreams, Hazrat Musleh Maud (may Allah be pleased with him) said he had related this dream to a few acquaintances at the time he saw it, which was during the early years of the first Khilafat e Ahmadiyyat. He saw that Sheikh Rehmat Ullah Sahib suggests to find out who is taller, Maulawi Muhammad Ali Sahib or Hazrat Musleh Maud. Although Hazrat Musleh Maud is reluctant to proceed, Sheikh Sahib forces him. In reality Maulawi Muhammad Ali Sahib was taller. However, when they are made to stand side by side in the dream Hazrat Musleh Maud is taller. Sheikh Sahib finds a table and stands Maulawi Sahib on it, still he does not match the height of Hazrat Musleh Maud. Sheikh Sahib then puts a stool on top of the table and makes Maulawi Muhammad Ali stand on it. Still, he is shorter. Sheikh Sahib lifts Maulawi Muhammad Ali to try and take him to Hazrat Musleh Maud’s height, but his legs dangle in the air and his feet reach Musleh Maud’s elbows. Thus God informed of things to come through his dream. Although at the time of the dream it was Khawaja Kamal ud Din who was perking up and not Maulawi Muhammad Ali, but in the dream God illustrated what was to come later on. Hazrat Musleh Maud (may Allah be pleased with him) said eventually Maulawi Muhammad Ali Sahib was so diminished as compared to Hazrat Musleh Maud that all his energy was expended in maintaining that in the sight of God honourable are those who are few in numbers. Although earlier on these people used to called themselves the 95% and used to say the others were a mere 4% or 5% and would imply that the majority of the Jama’at could not be following transgression. At the time of dissension within the Jama’at, Hazrat Musleh Maud received a revelation ‘We will reduce them to pieces’. These people who used to call themselves the 95% were truly reduced to pieces in accordance to the Divine revelation. Before his death Khawaja Kamal ud Din wrote, the revelation that Mirza Mahmood published regarding us has definitely come to pass and we have been reduced to pieces. Hazrat Musleh Maud (may Allah be pleased with him) said God has often manifested Himself to me thus fulfilling the [aspect of the] prophecy that he will have the honour of God’s Holy Spirit. People asked him about the wisdom behind his late declaration that he was indeed the manifestation of Musleh Maud although friends had been ascribing that to him for quite some time. The wisdom behind this is the same as it is stated in the Holy Qur’an: ‘…And it does not behove Allah to let your faith go in vain…’ (2:144). When God raises the Promised one after the advent of His Prophets, He does not want to embroil a community He has established in disbelief. He creates situation that most of the people are willing to accept him. Hazrat Musleh Maud said when people saw the prophecies of the Promised Messiah (on whom be peace) fulfil in his person, their faith enhanced. The wisdom behind making the claim at a later stage was that God did not will to put true believers through a second trial of faith. He did not wish them to go through the agony twice. Thus, God first made him a Khalifatul Masih and had the Jama’at take oath of obedience and then facilitated fulfilment of the prophecy. When the reality was before the Jama’at as clear as day, the one who was promised was also bestowed spiritual as well as secular knowledge so that the heavens and earth both would corroborate him and the believers would be protected from the blemish of rejecting or denying him. May God protect faith of Ahmadis. We should avail the spiritual knowledge of Hazrat Musleh Maud (may Allah be pleased him) as much as possible, which is available in Urdu language as well as other languages. Next, funeral Prayer in absentia of Sufi Nazir Ahmad Sahib was announced. He passed away on 7 February in Germany.